Just over a year after building our sun room we decided to finish the area below it with a basic concrete square block paver. The area had always been troublesome and we tried a few things over the years but decided to go with the pavers. 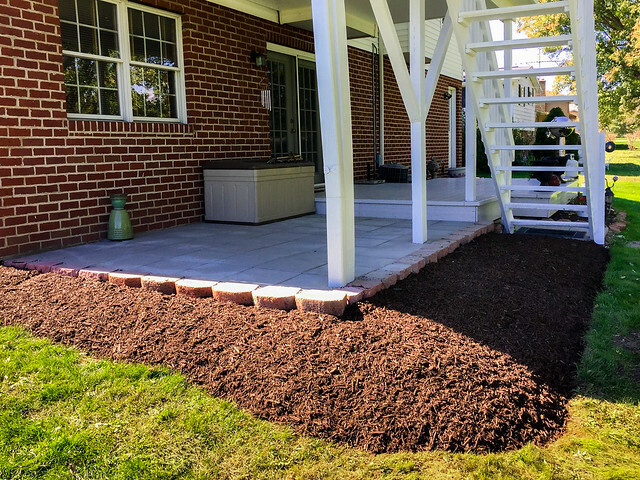 Once we did that we were able to do some finish mulch work that that was desperately needed. While we were at it we finished the white stain and added a second and in some cases a third coat of stain to the the steps and landing of the sun room. There is always next year to finish up the backyard and we have been thinking about trimming down the two big maples. A little bit each year. Here are a few pictures of the patio before and after.